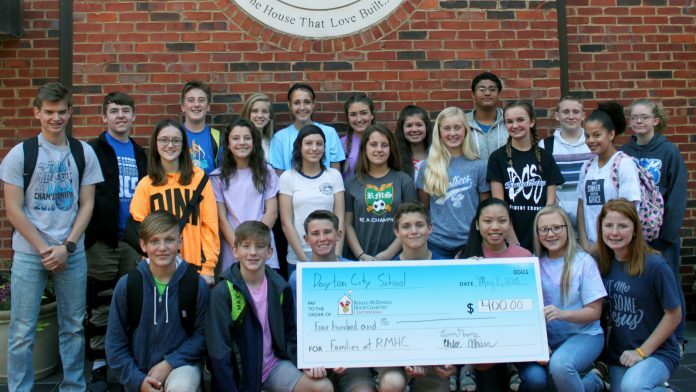 Dayton City School’s Student Council raised $1000, in cash and food, (which qualifies our school to be a Silver donor) and donated to the Ronald McDonald House in Chattanooga, TN. Since 1990, Ronald McDonald House Charities® of Greater Chattanooga (RMHC® of Greater Chattanooga) has been helping families stay together and close to the care they need through the Ronald McDonald House and Ronald McDonald Family Room. We provide a place like home and make children happier and healthier by making sure their families are footsteps from their hospital room– giving them a place to rest and refresh.